Six young men from Sandy Lake are making their hockey dreams a reality as they skate with the Grey Highlands Bravehearts of the Greater Metro Junior A Hockey League this season. Gunther Fiddler #4, age 19; Stiler McKay #9, age 20; Todd Crowe #11, age 20; River Crowe #18, age 19; Chad Linklater #23, age 20; and Randale McPherson #61, age 19 have been playing hockey together since they were young boys. This is Gunther’s second year in the GMHL and the first for Stiler, Todd, River, Chad and Randale. Gunther has played in different hockey leagues in Ontario, Manitoba and Saskatchewan. He joined the Grey Highlands Bravehearts in Markdale, Ontario for the 2013-2014 season after being traded by the Bradford Bulls. Stiler, Todd, River, Chad and Randale were invited to tryout for the Alliston Coyotes by the teams General Manager Dean Beardy of Sachigo Lake back in August. All five boys were successful but were eventually traded to the Bravehearts where they joined Gunther and fourteen other teammates. The opportunity to play in a high level hockey league like this has been a dream of Randale’s since he was a kid. “It means the world to me. I never thought I was this skilled." River says getting to step on the ice and train with the team is the best part of the experience. “The most challenging is the dry land training,” he adds. The boys have been adjusting to the new schedule that includes 8km runs, dry land training and ice practices every day in between games according to River's father Chris Crowe. Chad says he’s still getting used to the high pace of the league but he’s doing this for his community and to be a role model for younger players. “I just love playing hockey." The Bravehearts opened their season with a win against the Meaford Knights. Todd scored the first goal and Chad followed with a goal for a final score of 5-2. They lost their second game against the undefeated Tottenham Steam. The boys not only play on the same team but five of the six of them live together as well. They are billeted with a woman they say is nice and supportive of their hockey endeavors. “Our billet mother is training us harder than our team training,” says Randale. Chris says the boys’ billet mom ensures they have everything they need like gym memberships and suits that they are required to wear to each of their games. The billet mom sends Chris a monthly invoice for these extra expenses not included in the $500 monthly billet fee. Chris collects the money from each boy’s parents and forwards the payment to the billet mom. The parents are also responsible for paying the $500 monthly billet fee. Gunther’s grandmother Violet Fiddler says the financial responsibility can be tough to manage. Last year, Violet and her son Peter paid the $7,500 registration fee plus the billet fees for Gunther on their own. This year, Sandy Lake Chief and Council are helping with sponsorships for the registration fees for all six Bravehearts from Sandy Lake. Chris and Violet say the parents are fundraising to help with the costs of billets and extra expenses. He says additional fundraising will take place to pay for the boys’ travel home from Toronto to Sandy Lake for Christmas. Chris says the boys are helping each other by talking to one another when someone is feeling lonely. He adds that he chats online with them regularly. “It’s a little tough being away from family, but it’s going to be worth it,” says Chad. The Bravehearts next game is September 26 against the Rama Aces. Their last regular season game is February 14, 2015 against the Bracebridge Blues. Team schedule, player stats and other Grey Highlands Bravehearts information can be found online at www.greyhighlandsbravehearts.com or on their Facebook page. There are 22 teams and two divisions in the GMHL. More information about the GMHL can be found online at www.gmhl.net. 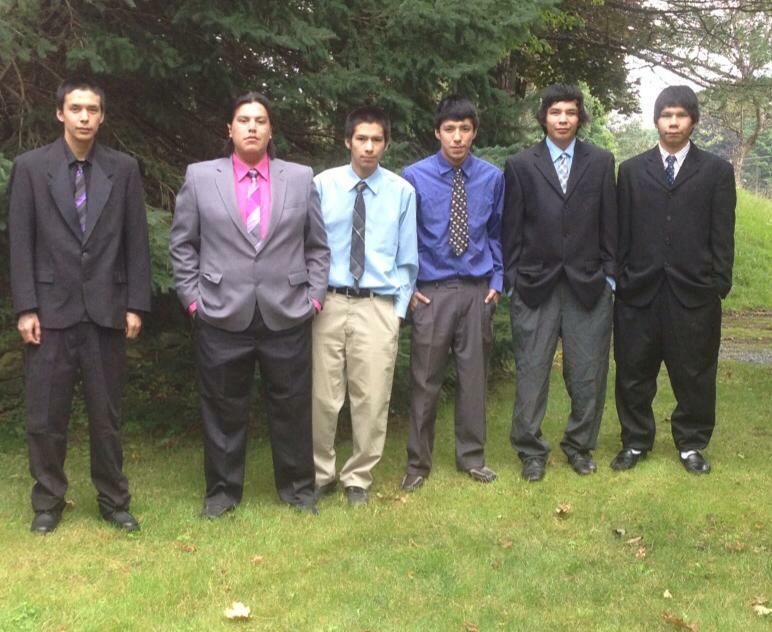 Left to right: Todd Crowe, Gunther Fiddler, Stiler McKay, River Crow, Chad Linklater, Randale McPherson from Sandy Lake are playing for the Grey Highlands Bravehearts in the Greater Metro Junior A Hockey League for the 2014-2015 season.